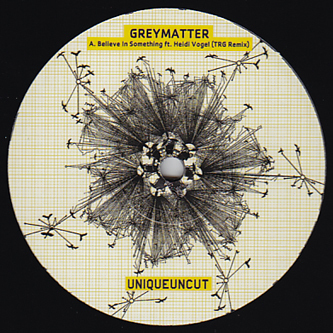 Big 12" for those burrowing into the world of Funky/BrokenBeat/Garage with Greymatter presenting three original tracks backed with a heavyweight Broken Beat refit from TRG. Starting with the A-side, TRG's mix of 'Believe In Something' featuring vox from Heidi Vogel is the first time we've heard the guy attack a Broken Beat riddim. While it's not a million miles from his usual 2-Step/Garage styles there's definitely a jazzier and harder syncopated flow to this that also reminds of last weeks killer drop from Altered Natives (check this if you haven't already!). However, the flipside is far more interesting for the beat heads, starting with the oddly pitched 'When I Was Lost' formed from sumptuous subbass drops and swung beats sounding like Broken Beat at 33 instaed of 45. The Sound System killer 'Grot' follows with a strange dub experiment fiddling with the delay and reverbs to turn the riddim into a nobbly swamp oddity before the wicked 'Essay' rounds off with a downbeat polyrhythmic stew of taut yet loose patterns cascading around the riddim. Interesting stuff that fans of Floating Points, Mike Slott or even Dego should be peeping.